Recently I wrote a column on what Buffalo Sabres might make the Greater Buffalo Sports Hall of Fame someday. I took the Hockey News’ list of ranked Sabres in their history and tried to guess who might be going in next. Fine. But what about the Bills? Sadly, no one has done half the work for me by ranking the 50 greatest Bills in history. Let’s try a different technique. The Bills’ media guide lists all of the players that have named to play in a Pro Bowl (1970 to present) or AFL All-Star Game (1960-1969). That’s a sign that a particular player has to be reasonably good. I threw out everyone who was in just one such game, giving me a manageable list. You should know that everyone on the 1965 team played in the AFL All-Star Game against the all-stars of the other teams in a “Champions vs. All-Stars” format, so that skews the numbers just a little bit – more on that soon. I’m not saying this is a perfect way to determine a player’s contribution. If someone is on the roster for several years but only made a Pro Bowl once, he will be penalized. Meanwhile, someone who is very good while playing in Buffalo but was not here for long receives too much credit. For example, would LeSean McCoy go into the Buffalo Hall right now after three seasons – albeit superb ones? Longevity should be a virtue in the Hall of Fame discussion. Positions also play a role in the Pro Bowl selection process. Sam Gash made a couple of them as a blocking fullback, so it’s tough to argue that he is a Buffalo Hall of Famer over someone like Joe Ferguson or Elbert Dubenion. 8 – Billy Shaw, Ruben Brown. 7 – Andre Reed , Steve Tasker. 6 – Jack Kemp, Jim Kelly, O.J. Simpson, Mike Stratton. 5 – Thurman Thomas, Stew Barber, Joe DeLamielleure, Fred Smerlas, Kyle Williams, Cornelius Bennett, Butch Byrd, George Saimes. 4 – Ernie Warlick, Tom Sestak, Jim Dunaway. 3 – Cookie Gilchrist, Joe Cribbs, Eric Moulds, Kent Hull, Ted Washington, Shane Conlan, Bryce Paup, Robert James, Jarius Byrd. 2 – Tyrod Taylor, LeSean McCoy, Sam Gash, Wray Carlton, Wil Wolford, Howard Ballard, Jason Peters, Paul Costa, Jim Ritcher, Richie Incognito, Aaron Schobel, Mario Williams, Ron McDole, Marcell Dareus, Archie Matsos, Darryl Talley, Takeo Spikes, Harry Jacobs, John Tracey, Nate Odomes, Tom Janik, Brian Moorman. That’s 51 names. Janik, Costa and Carlton weren’t named to an AFL All-Pro Team in 1965, and may not have played in the All-Star Game that year under normal circumstances. I’m willing to disqualify them from consideration here for purposes of this exercise. We’re not trying to rank the top 50 this way, although it’s interesting that Ruben Brown made more Pro Bowls than Hall of Famers Andre Reed, Jim Kelly and O.J. Simpson. If you are counting, Scott Norwood and Mike Mercer are the only Bills kickers to be named to the Pro Bowl (once each). And for fun, here are the players on the Bills’ 50th anniversary team who aren’t on this list: James Lofton, Pete Metzelaars, Steve Christie, and Henry Jones. 5 – Stew Barber, Kyle Williams, Cornelius Bennett. 3 – Joe Cribbs, Eric Moulds, Ted Washington, Bryce Paup, Robert James, Jarius Byrd. 2 – Tyrod Taylor, LeSean McCoy, Sam Gash, Wil Wolford, Howard Ballard, Jason Peters, Richie Incognito, Aaron Schobel, Mario Williams, Ron McDole, Marcell Dareus, Archie Matsos, Takeo Spikes, John Tracey, Nate Odomes, Brian Moorman. Now we’re getting somewhere. Those who have been chosen for three Pro Bowls of their equivalents deserve a look. Let’s see who we have, leaving out Kyle Williams – an active player who will certainly be picked when he is done with his NFL career. Stew Barber – He was part of the Bills from 1961 to 1969, and played in five straight All-Star Games. Barber was a second-team pick for the All-Time All-AFL squad. Barber went on to become a team vice president and general manager from 1979 to 1982. That era included a couple of playoff teams, although Chuck Knox has gotten most of the credit for that bit of success. Barber lost his job around the time that Kay Stephenson was hired to replace Knox as coach. 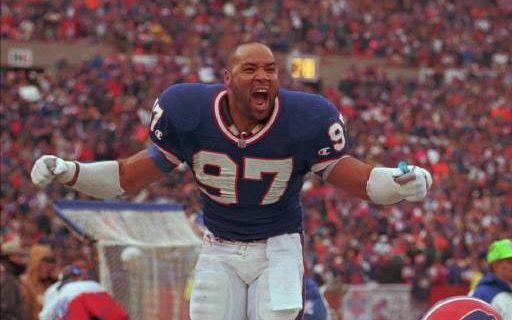 Cornelius Bennett – When the Bills acquired him in 1987, they hoped they were getting the next Lawrence Taylor. That was a bit too optimistic, but Bennett was still plenty good. He made four straight Pro Bowls and was a two-time AFC Defensive Player of the Year. Bennett stayed eight years before leaving to play in Atlanta and Indianapolis. He was on the Bills’ 50th anniversary team. Jim Dunaway – This might be the most underrated player on the list. Dunaway spent much of his career playing alongside of Tom Sestak, who was an all-time great when healthy. Yet Dunaway made four straight AFL All-Star Games from 1965 to 1968. You probably didn’t know that he ended his career with the undefeated 1972 Miami Dolphins, and he is a member of the AFL Hall of Fame. An off-field incident in 1998 concerning the death of his wife clouds our judgment of him now. Eric Moulds – It’s easy to forget that he was with the Bills for 10 seasons. Moulds caught at least 64 passes in each of the last eight seasons, and that put him on the team’s 50th anniversary squad. He played with Houston and Tennessee for a season before retiring. What would a player with those skills have meant to the 2017 Bills? The other three-time Pro Bowl picks weren’t around all that long: Cribbs (five years), Washington (six), Paup (three), James (six), and Byrd (five). McCoy and Incognito (three years each) join this list in a little more than a week. Washington was very good during his time here and probably has the best argument of the five of them. By the way, here are the Bills who are in the Greater Buffalo Sports Hall of Fame and didn’t qualify for my Pro Bowl list: Al Bemiller, Steve Christie, Elbert Dubenion, Booker Edgerson, Joe Ferguson, Paul Maguire and Reggie McKenzie. The idea of this exercise was to identify candidates for local honors. I think it has done that. Barber, Bennett, Dunaway and Moulds certainly could be on a short list for consideration in future years.